I love my granola, but even though it is much healthier than pre-packaged granolas it does have quite a bit of sugar in it. Which unfortunately means that it is not the healthiest thing to be eating every day. In addition, while it is easy to make, it does take some time so I have to plan for it if I want to be sure I have it on hand for breakfast. With that in mind, I decided to go back to eating regular oatmeal for breakfast, adding trail mix and dried fruit. 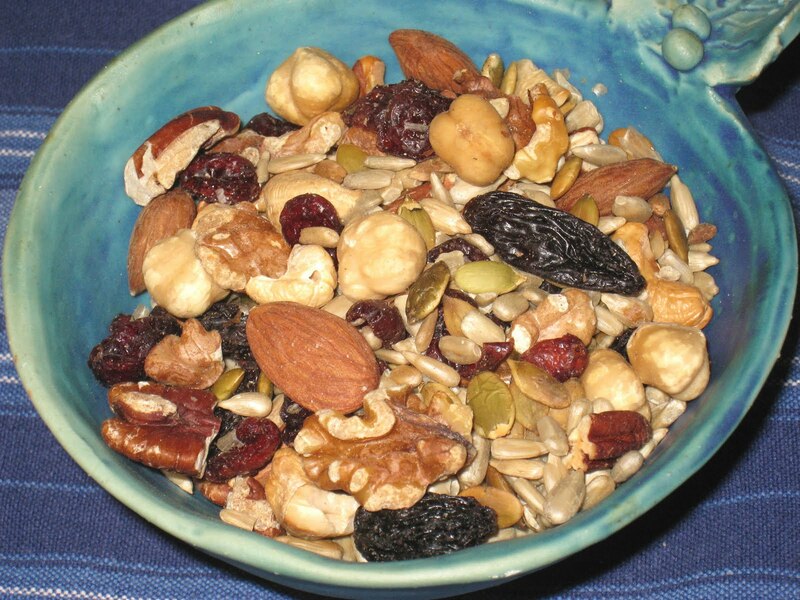 In the past I would just buy a bulk trail mix, but since I had so many of the ingredients already on hand I thought it would be just as easy to make my own. And it was. I preheated the oven to 350 degrees, put my mix of nuts on a rimmed baking sheet, and baked them on a middle rack for about 25 minutes, checking every 10 minutes to make sure they weren't burning. I did almost burn one batch and they were not good. They were edible and too expensive to throw away, but I will never make that mistake again. I set the timer and I check. What I love about making it myself is that I control the ratio of the kinds of nuts, and the fruit. I use the expensive nuts more sparingly and go wild with the less expensive. I also have all of the nuts available for other uses, which I would not be able to do if I were buying the pre-mixed packages. I don't know if making it at home is less expensive than buying the pre-packaged version. That would depend on each batch, and what you ratio of more and less expensive nuts you used. But when the prices range from about $3/lb to $15/lb for the various sees and nuts, you know the pre-packagers are using mostly the cheaper ingredients and averaging higher on the pricing. But the main reason I like making my own mix? It just tastes better. 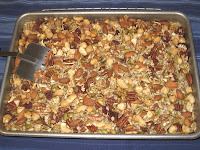 Note: You can use any combination of nuts and seeds, in any amounts. Combine all ingredients in a rimmed baking dish. 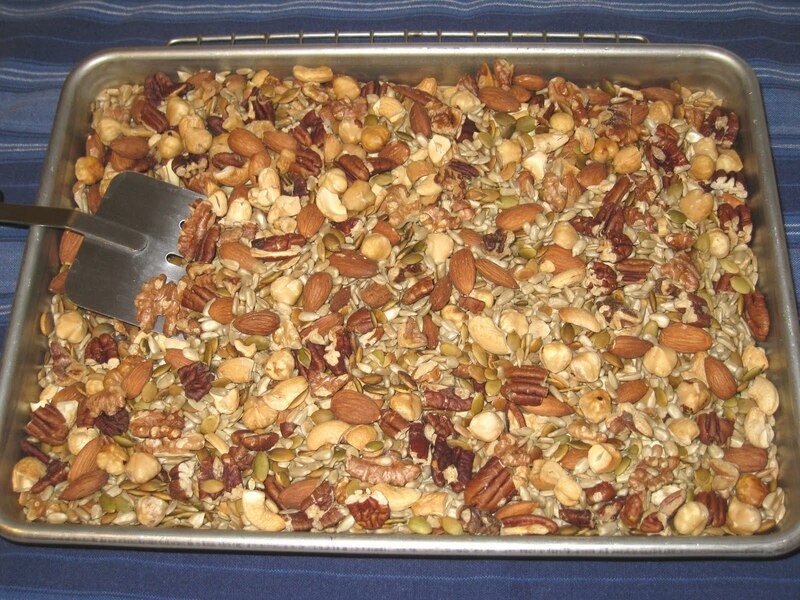 Bake for 20-25 minutes, until nuts are golden. Check and stir every ten minutes. Let cool and mix with the raisins and cranberries. Store in an airtight container for a few weeks.